Even though the flight was slightly miserable, compared with our last trip (United losing our bags and us going 3 days without them, wearing the same clothes the whole time, etc....) this one has been flawless. We took off from ATL around 4:30pm and were standing at our front door by 11:30am Paris time (5:30am ATL time...with only a few hours of sleep. But still, a success!). Even in my totally exhausted state, all I can think about is how perfect Paris is. It's old and charming, picturesque and elegant--it's entirely lovely. 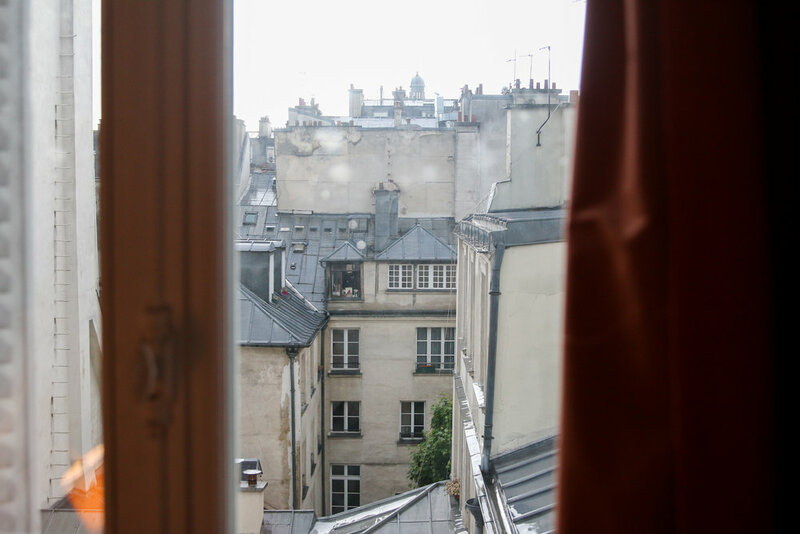 We're excited to call this little corner of Paris home for a little while. We pulled into the city around lunchtime, but our host was a few minutes behind us. So first we wandered down the street to a little cafe. We stopped in for a coffee and croissant, sitting at a charming little table with all of our luggage (2 suitcases, 2 carry ons, a guitar, a book bag, and a purse). The cafe is only 2 doors down from our apartment, and the waitress didn't speak any English. So that must mean that this part of town isn't too touristy, which is great news. I'm hoping to brush up on my French while we're here. There are big, 8 ft. windows in every room, wood floors with beautiful detail, a tiny kitchen with everything we'll need to cook this month, and a cobblestone courtyard. It's so dreamy. We went to the French version of Target tonight to stock up on soap, toilet paper and other necessities (i.e. wine), and we felt so odd trying to read the french on the bodywash bottles and trying to find the detergent section without asking anyone (because we don't know how). I'm hoping that our blending-in skills will improve over the next month. But we did find one gem--some delicious looking fresh Ramen, that we ended up eating tonight for dinner alongside our $4 bottle of wine. French life so far is good. I'm hoping to sleep off this jet lag and jump into French life tomorrow with a market in the morning. The goal is to get some fresh flowers for the apartment and something to cook for the next few days!